For most of us, this pre-holiday time is filled with stress, deadlines, and shopping lists. I always try to avoid stress in my life, so I admit that this is not my favorite time of year. I feel pretty good that I have finished up my homemade gifts and have mailed the ones that need to fly far away. 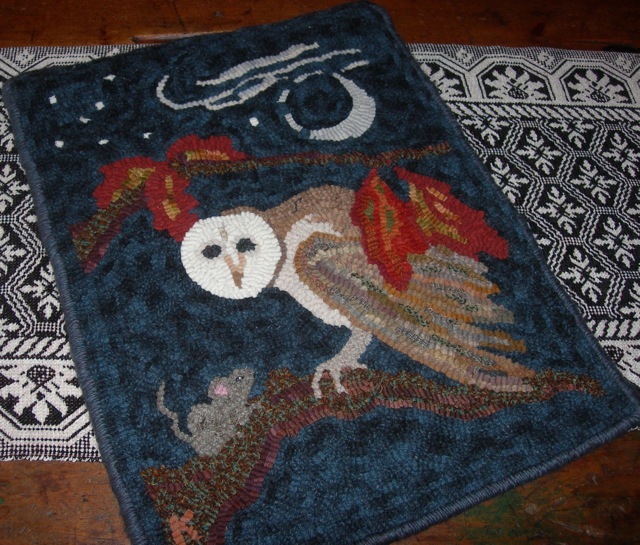 I was so excited to mail my friend’s Waxing Crescent rug to her. I wrapped and boxed it up with lots of tape and then realized, thankfully not too late, that I had not taken a photo of it. I’m so glad that I didn’t have to wrestle it back from the post office lady! I rarely re-hook one of my patterns, but this was fun to do. It never comes out the same way, because of the wool that I have available at the time, and maybe some changes that just seem like the right thing to do. For those of you, who buy patterns to hook, you are always allowed to make some changes to the pattern. Maybe you want to add some special design elements to make it more personal, or maybe you want to leave out a few parts of the pattern to keep it simple. Design credit should always be given to the original pattern designer, with changes by [you]. Be creative and have fun. Hook outside the box! I hope your holiday time is going along well and filled with fun and special times spent with loved ones. There’s a lot of beauty out there and in the gifts that are made by hand and come from the heart! Waxing Crescent all set to fly. Ready to be boxed and taped up again!